A real estate growth and development surge has taken center stage in the City of Cincinnati within the last five years. It’s an exciting story typically illustrated by focusing on the renovations of Over-the-Rhine’s 19th century architecture, and more recently, a decidedly different type of revitalization two miles away, in Uptown Cincinnati. Uptown Cincinnati is an attractive district with a high-growth economy that includes a healthcare hub, an ecology of advanced research and a pedigreed employment base. The area hosts 45,000 residents living alongside high-growth sectors and world-class academic research employing a total of 50,000 people with an annual economic impact of $11.6 billion. Despite being home to four of the region’s six largest employers, the five Uptown neighborhoods had long been neglected, but that changed in 2014, when the five anchor institutions decided to revitalize and invest in their home. To do this, the University of Cincinnati, UC Health, TriHealth, Cincinnati Children’s Hospital and the Cincinnati Zoo & Botanical Garden founded the Uptown Consortium (UCI). Since then, UCI has led the charge by reenergizing the communities, investing over $400 million in projects and advocating for an urban interchange at Martin Luther King Jr. drive. Now that the MLK interchange is opened, UCI looks to the future of the area directly around the new ramps, a blighted, underdeveloped area of Uptown. The Uptown Gateway project led by Terrex Development and Construction and Messer Construction will be located in the southeast quadrant of the Corridor. The $150 million project will include a dual-branded hotel, office space, activated green space and a public parking garage. The northeast quadrant will be developed by Neyer Properties and Kulkarni Properties. 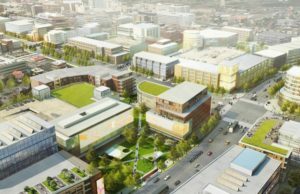 While this development is in early planning discussions with the developers, the City of Cincinnati and the Avondale community, the group plans to create a world-class, mixed-use development for innovative companies and research. The University of Cincinnati 1819 Innovation Hub is scheduled to open next summer. This center will be a space for students, university faculty, businesses and the community to work collaboratively and provide intradisciplinary insights for new technologies. The northwest quadrant was named the preferred site for the National Institute for Occupational Safety and Health (NIOSH) development by the Center for Disease Control and Prevention in July of this year (the CDC is NIOSH’s parent organization). The University of Cincinnati Gardner Neuroscience Institute, currently under construction, will be a leading treatment and teaching center for complex neurological conditions. Overall, the efforts by the Consortium has induced over $1 billion in economic development in the region. To learn more about the Uptown Consortium and its projects, please visit uptowncincinnati.com.